Bhamer is well known for its underground caves which are known as Gavali Raja's House. 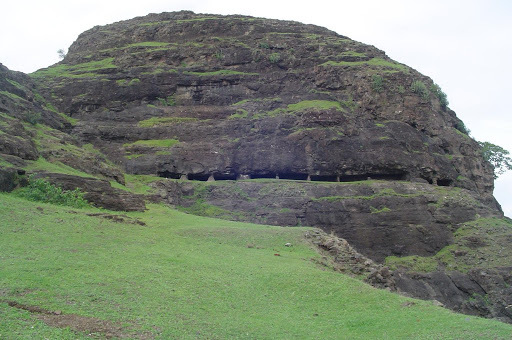 These caves are located in the escarpments of the hills with some are honeycombed, some of them are plain and shapeless, but others are regular buildings with pillar-supported roofs. Bhamer, however, is known for its fort known after the village name and more so for the caves or rather monk’s dwellings that are in the escarpments of the hills above the village. The fort located at the cast end of a rugged irregular range of rocky hills is divided from the rest of the range by an artificial chasm. The natural escarpment of the fort that overlooks the village has been strengthened in places by masonry constructions. Though the hill is of a considerable height, the ascent is easy and roundabout. On the southern face is the entrance leading into the fort. Inside are several cisterns of good water as also four large store rooms hollowed out of the rock. There are many ruined gateways and gates and nearly ruined towers. Time has also withered away the artificial fortifications at many places. It is supposed that the town was destroyed while punishing Kale Khan, a Muslim rebel, who had seized it in 1736. It never regained its original glory. By Train Nearest railway station is Choupale and from there 38 km and Nandurbar and from there 40 km by road.